At Disney World, new rides are opened briefly and at times of the operators’ choosing before the Grand Opening. This is called a Soft Opening. The past month has been the Soft Opening of my blog, a time to gain some valuable experience, test the equipment, and generally check that the ride is functioning according to spec. So far, the early riders have been fellow book bloggers (thank you!) and a handful of people from the rest of my life (thank you, too!). Today is my Grand Opening, the day that I tell everyone else, pretty much anyone that I can reach in my network through Facebook, Twitter, email, and other sites. This will include people I have known since first grade and people I have never actually met but connected with through libraries or books sometime in the last few years. Thank you to each of you who have come to celebrate this Grand Opening. And, what would a Grand Opening be without a Door Prize? Leave a comment on this post stating where you heard about Joy’s Book Blog (partly because I’m curious and partly so that I can tell the difference between real people and spammers) to register for the Door Prize. Leave a comment before 11:59 CST on Monday night, February 7. One randomly selected commenter will win a $25 Amazon Gift Card! If you are visiting for the first time or the thirty-first time, you are eligible to win! Do you know anyone else who would like to read a blog about books? Please send them a link to my blog! How did you hear about Joy’s Book Blog? Oh, so excited!!! I love books and opinions!! And this sounds like so much fun!!!! Congratulations on the new blog Joy! I’m looking forward to it! I love the colors, purple! PS I found out through your invite on FB. Looking forward to reading about your readings! The new site looks great and I’ve already added it to my RSS feed. Sorry I didn’t not get back to you sooner. I got busy at work, snow days and then the email got buried in my inbox. Thanks for the invitation to the Grand Opening. Clearly a work of passion! Eager to see new posts and reviews! Hello, my fave NaNoWriMo (one-time, years-past) newbie pal! I got your email this morning. Impressive blog. (Posting daily? Wow!) I like the format you’ve adopted for your reviews, and am now adding you to my feed. Congratulations on a fab start! Congrats, Joy. I saw your email message. I host a series of online public programs called OPAL (www.opal-online.org). Many OPAL programs are about reading and literature: Book discussions, author interviews, genre discussions, etc. We record and archive most of the programs, too. Congratulations, Joy, the site looks great! I’ve only known about your blog since Bloggiesta, when you left a comment on my blog. And now we’re reading buddies! I found out about this through Facebook. I wish you well with your blog and look forward to reading it! I’d love some of your recipes – always looking for something new to make. Hi Joy, Great blog! So glad to get your e-mail about it. I’ll be checking in regularly. Thanks. Got the news via email from you. Joy, I loved what you had to say about criticism, education and elitism. Good luck with the blog! I love your blog, Joy, and especially appreciate the great reviews of the cool cookbooks you’ve blogged about! I am anxious to check out Love in the Time of Cholesterol and Women’s Heart Cookbook. Very attractive blog. Heard about it on Facebook. I liked the links. Congrats on your blog. I found out about it through Facebook. I love some of your recipes. Got the invite on FB and email. Congrats on your new endeavor, I’ll add you to my RSS reader. Happy blogging! Joy, love your new online space. Happy reading and writing! I found out about your blog through your Twitter feed. Congrats on the great new blog, Joy! I’ll be a regular visitor! Very awesome. Looking forward to reading on a regular basis. Saw this via invite on facebook. Thanks for the Beck announcement. The web is a big place and I don’t suppose I’d have found this site otherwise. Got the invite via email and on Facebook. Excited for you…yay! Congratulations on the new blog! What a great way to pursue your book passion. All the best. Looks great Joy! I first heard about it over lunch, I think, when you asked me to look over a list of possible names for the blog. But don’t award me the door prize, it would be unseemly for your brother to win. You have put a huge amount of effort into this. I wish you readership and a well deserved sense of accomplishment. It’s a joy alright to read about books – Bon Voyage on your journey. Best wishes for your new blog, Joy! I heard about it from your e-mail. I look forward to reading more. Hi Joy! I found your blog from the e-mail you sent out. Can’t wait to catch up on all the posts! Love hearing about new books. Joy you and I connected through the Monday where are you reading meme…. I love the grand opening what a fantastic idea – and your blog looks lovely! 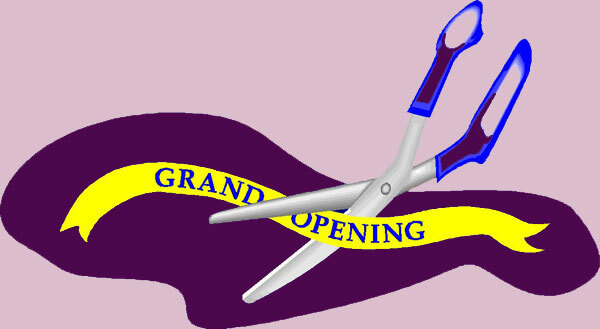 Congratulations on your Grand Opening and Welcome to the Book Blogging World. I believe I first met you through Weekend Cooking but it may have been the Foodie’s Reading Challenge. Anyway, your blog is beautiful and it’s nice to make a new blogging friend. Wonderful opening! I love the blog, of course, a bit of a sucker for books myself. I’ll check in frequently! Congratulations on a very neat blog! You know, of course, that cooking is one of my “things”, so reading about cookbooks was great. Your Mom would love it. Miss seeing you.Come to Louisiana some time. Got your card, thanks. I love your purple! I found you via your Weekend Cooking link at Beth Fish Reads. Congratulations and Happy Blogging!! I will be sharing your book blog with my book club. From today’s brief scan, I got some great ideas for future titles I’d like to curl up with. I envy the time you seem to have to read! Thanks for the email about your new blog! Congratulations on the new blog — and good luck! I found your blog through the Weekend Cooking meme! Congrats on the new blog! Can’t wait. I thought I’d register before I start enjoying. I love cookbooks! and am excited to read your reviews. Yay, congrats on the JOYFUL GRAND OPENING of Joy’s Book Blog! Congrats on your grand opening! I saw your post on Sheila’s comments and thought I would check it out. Good luck with it and looking forward to your posts! You have incredible readership for a new blog. Where can I sign up to follow? Will you have email subscriptions available? Thanks for visiting my blog – repaying your visit I have discovered a lovely new blog and I look forward to dropping by again. Hi Joy! So excited to read your book blog – and I love that you’re starting off with Sharon Shinn! I got the email… I guess I need to find you on Facebook! This is quite a neat thing you have here… I’ve never been a reader but I’m actually looking forward to your suggestions and opinions. Congrats and best wishes! Congrats on the opening of this beautiful blog. May it be very successful! I found you via the Monday Meme, but I’m quite sure I’ve been by before. I heard about ur site when you visited my blog – thanks for that! Congrats on the grand opening. I found you from BookJourney. I started my website focusing on children’s books for parents and kids about 8 months ago. It has been an amazing ride and I am still finding so many different ways to promote books and reading. I know you will have fun! Please think of my site for anyone you know who enjoys children’s literature. I came over from the Monday meme. Second, love your review of the Healthy Family cookbook. I also look for something a bit more exciting with a cookbook so that one looks like a no go to me. Also, I’m trying to find your follow or feedburner subscription. Did I miss it? I’ll take another look around. Congrats on the Grand Opening of your blog. I do love the layout of your blog. Purple is a fab colour to grab my attention (it doesn’t take much).